I'm not sure how to describe the appearance of the flame. It seems to look more like a plasmatic flame then a wood flame, not that I know what a plasma should look like. When one burns other biomass in the Woodgas Stove it is fairly obvious when the volatiles have been consumed and only the charcoal is remaining. But, when burning this material, there is no crossover point or one that I was able to notice. What happens is that the flame just keeps getting smaller and smaller and smaller. This produced a problem for me. I did not know when to stop the experiment. Finally, I gave up after 25 minutes. 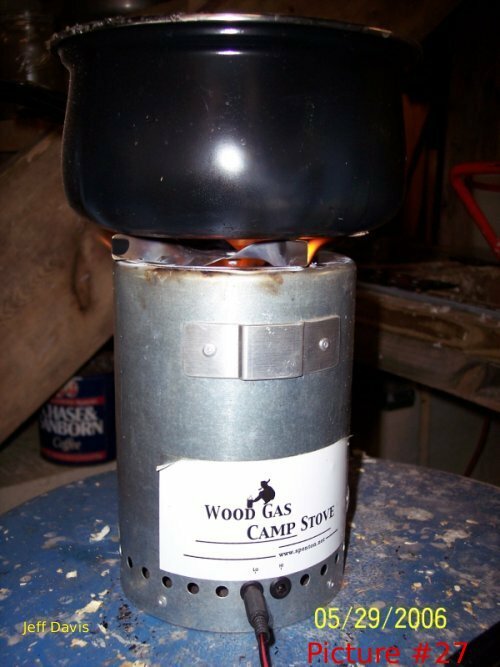 I loaded 100.5g of oven dried pond scum fuel into the Woodgas Stove and lighting was accomplished with a map torch. It is more difficult than other fuels like wood chips, paper fireballs and wood pellets to light and this may explain why it smokes during the beginning of the burn. Later it clears up. A crude estimate would be; smoky for the first third of the burn. A pot with 602g of water was placed on top of the stove, when the experiment was over and the water cooled to ambient temperature, 182.1g of water was evaporated/boiled away. The water boiled for 10 minutes and simmered for the remaining time. The 100.5g of fuel whence 17g of ash was left over. I measured the pseudo fireballs to have a density of ABOUT 0.250 g/cm^3. Picture #27 through #33 are self-explanatory. The remaining ash can be seen in picture #34. This ash was returned to the pond. A sawdust/pond scum pseudo fireball was also produced. This can be seen in picture #37. It's also the left pseudo fireball in picture #35. It was a 3 to 1 mixture. Three parts sawdust to one part WET pond scum. The pond scum, when dry, will shrink a lot. I would not be surprised to find out that it's volume is half or even one third when dry. It bonded well. In part 1 of this article, I mentioned that a pseudo fireball was made from the material produced directly out of the disposal. This can be seen in picture # 36, it is also the middle pseudo fireball in picture #35. The right pseudo fireball, in the same picture, is the pure pond scum pseudo fireball. It stars in picture #38. There is an oder when processing this feedstock. It's not too bad but I do not believe that pond scum will ever become a great potpourri. I have also notice that it has a bit of a diet suppression property. This is the last installment of this article. I hope it will be of some help to others!